What’s behind the crazy variation in Total Knee surgery pricing? 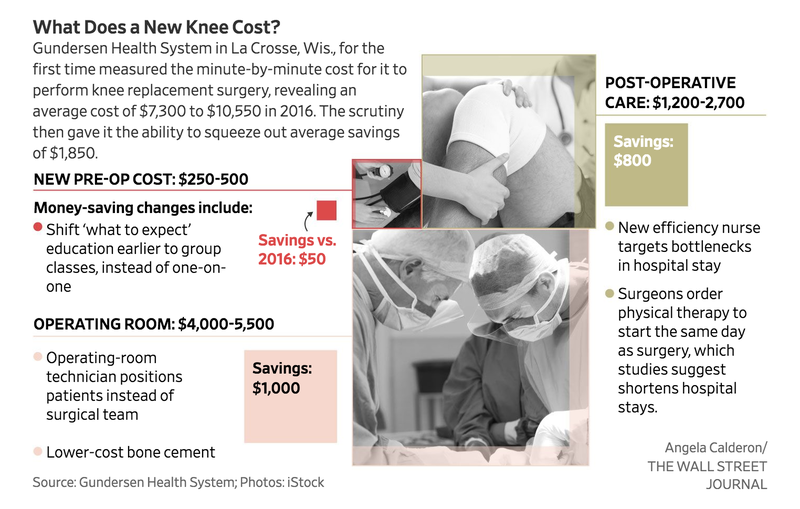 For nearly a decade, Gundersen Health System’s hospital in La Crosse, Wis., boosted the price of knee-replacement surgery an average of 3% a year. By 2016, the average list price was more than $50,000, including the surgeon and anesthesiologist. Yet even as administrators raised the price, they had no real idea what it cost to perform the surgery—the most common for hospitals in the U.S. outside of those related to childbirth. They set a price using a combination of educated guesswork and a canny assessment of market opportunity. Prompted by rumblings from Medicare and private insurers over potential changes to payments, Gundersen decided to nail down the numbers. During an 18-month review, an efficiency expert trailed doctors and nurses to record every minute of activity and note instruments, resources and medicines used. The hospital tallied the time nurses spent wheeling around VCR carts, a mismatch of available postsurgery beds, unnecessarily costly bone cement and delays dispatching physical therapists to get patients moving. The actual cost? $10,550 at most, including the physicians. The list price was five times that amount. 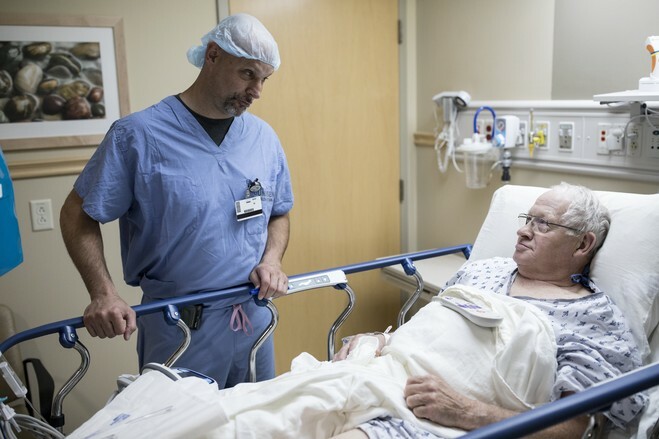 Surgeon Mark Topolski spoke to Walter Spolum before his knee was replaced in June, and marked his left leg. Competitive forces are out of whack in health care. Hospitals are often ignorant about their actual costs. Instead, they often increase prices to meet profit targets. Patients, especially those with insurance, often don’t know the price of a procedure and rarely shop around. This dynamic is a driving force in the explosion in health-care spending in the U.S., which will soon reach close to 20% of GDP. Americans spend more per capita on health care than any other developed nation, even though they aren’t buying more health care overall. 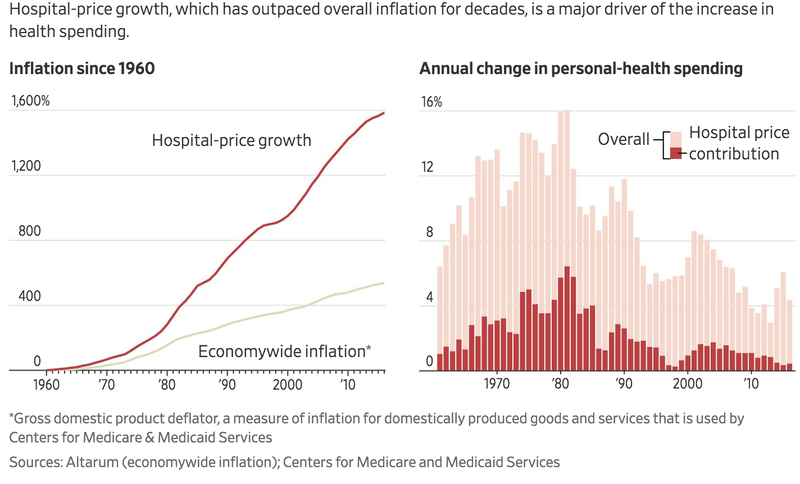 The rise in hospital prices has outpaced economywide inflation for decades. “When price isn’t tightly linked to cost, that is a sign that the market isn’t competitive,” said Harvard economist Leemore Dafny. Mr. Spolum’s knee surgery. During the hospital’s 18-month project, an efficiency expert trailed doctors and nurses to track labor and supplies used to establish a precise cost. Hospitals can be shielded from the competition that forces other industries to wring out expenses and slash prices. Hospital list prices are a starting point for negotiations with insurance companies over what they will actually pay, and those deals are confidential. Consolidation has given hospitals greater pricing power in many markets, according to health-economics researchers. 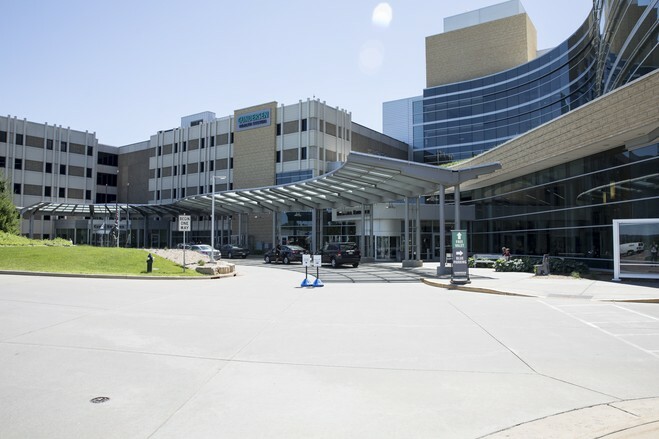 “Being cost effective was not an imperative in that type of market dynamic,” said Derek Haas, chief executive officer of Avant-garde Health, a health-care-cost accounting company that worked with Gundersen. 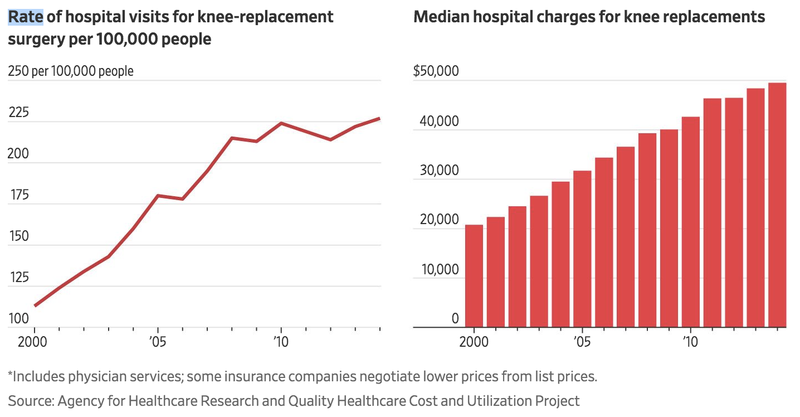 Knee replacement has become more common in the U.S. while at the same time climbing in price. 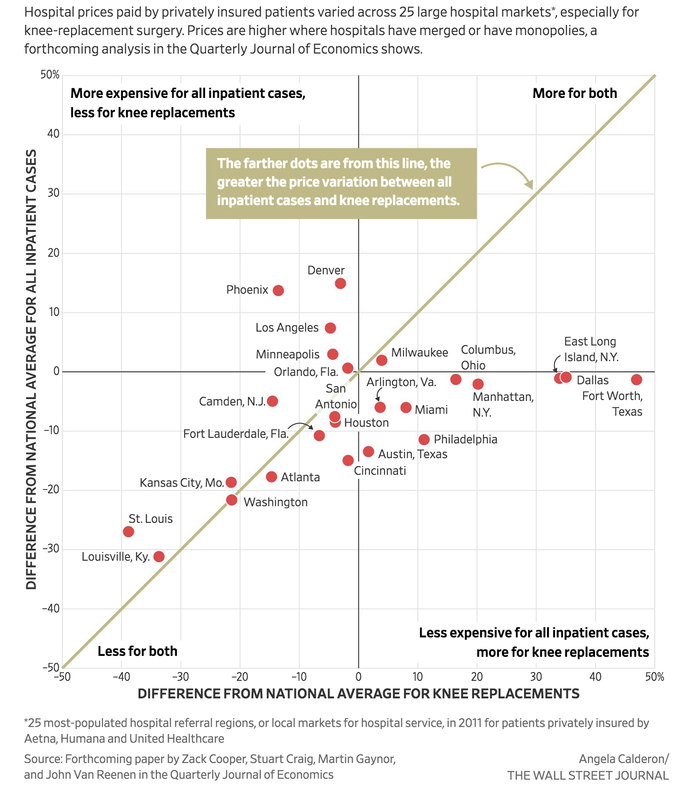 On knee-replacement surgery, higher-cost hospitals spent almost twice the amount lower-cost hospitals spent, despite largely similar quality and roughly comparable patients, research by Mr. Haas and Harvard Business School Professor Robert Kaplan showed. The study found the hospital had been using an expensive cement premixed with antibiotics and could switch to a less-expensive variety. Above, a technician prepares the cement during Mr. Spolum’s surgery. For consumers, the prices paid for the surgery at some hospitals in the U.S. were more than double the prices at others, according to an analysis of 88 million privately insured people to be published in the Quarterly Journal of Economics. 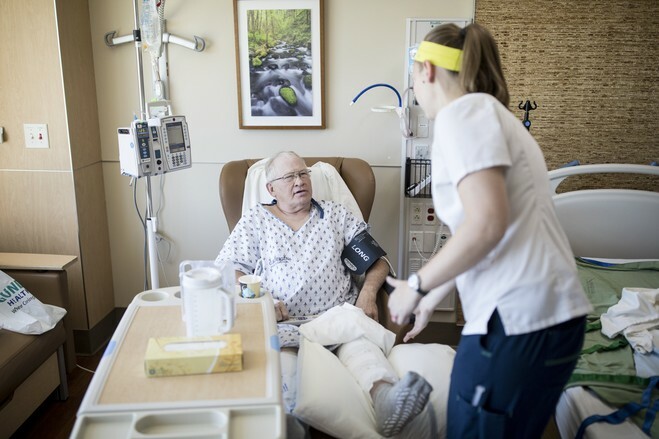 Before 2016, Gundersen Lutheran Medical Center, one of the Gundersen system’s six hospitals, lacked even an estimated cost for knee-replacement surgery, which it performs an average of more than 400 times a year. 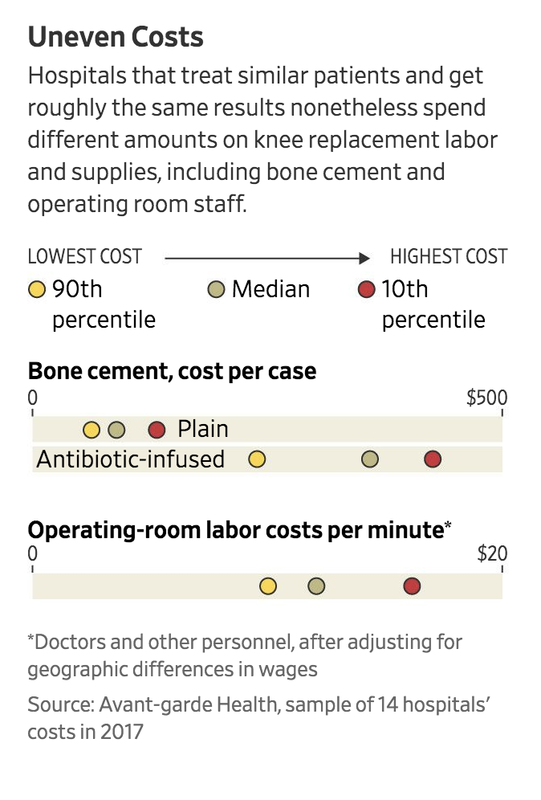 The hospital long set its price, with help from consultants, to be on par with other hospitals, and to sustain the orthopedic department’s margin. Cost approximations, such as those used by Medicare to value a physician’s time, are a starting point for many hospitals. The project to nail down a cost was initiated in 2013 by Lisa Wied, who then oversaw Gundersen’s orthopedic department. She had stumbled across an initiative on the internet by the Institute for Healthcare Improvement, a Boston-based health-quality nonprofit, to dig into hospital joint-replacement costs. “It hit home,” said Ms. Wied, who previously worked in manufacturing, an industry that more scrupulously tracks its costs. What Does a New Knee Cost? Ms. Wied dispatched a nurse and an efficiency expert with stopwatches to trail patients into exam rooms and surgical suites. They mingled with technicians, doctors and physical therapists, measuring time spent and supplies used. Labor is the single-largest expense for hospitals, and the minute-by-minute accounting gave the hospital a precise look. On average, a certified nurse assistant needed 10 minutes to collect personal items such as glasses or dentures from patients before surgery. A technician took another 20 minutes to insert an IV into patients awaiting the operation. Time spent in Gundersen’s operating room—the most expensive minutes of a patient’s hospital visit—averaged 95 to 105 minutes. Gundersen Lutheran Medical Center, in La Crosse, Wis. The biggest revelations came after patients left surgery. Kendra Reynolds, Gundersen’s inpatient orthopedic director, and nurse Beth Krage saw an early map of results, dotted with storm clouds to indicate where the analysis identified potential problems. “It looked like a thunderstorm,” said Ms. Krage, a clinical nurse leader for Gundersen. On busy days, the hospital had no available beds for knee-replacement patients after surgery. Patients with nowhere to go remained in temporary postsurgical units for as long as 24 hours, prolonging their recovery. The backlog created confusion among physical therapists, who waited to start recovery until patients transferred to the hospital’s orthopedic unit. Meantime, doctors didn’t always order physical therapy to begin quickly even when patients were rapidly transferred to the orthopedic unit. Research shows patients who start moving soon after surgery, often the same day as an operation, have shorter hospital stays, less pain and more strength and mobility than patients who wait. A rehab team worked with Mr. Spolum hours after his surgery. The hospital made changes after the study to begin physical therapy more quickly, which could shorten hospital stays. Different surgeons varied on other procedures, too, for reasons that weren’t always clear. One consistently inserted a drain in patients to prevent hematomas, or blood that pools under the skin. Other surgeons did not. The drain added to costs, required time to remove and increased risk of infection. Nurses spent significant time preparing patients to go home, wheeling televisions and VCRs to patients’ bedsides to play educational videos, before coaching patients one-on-one on what to expect next. It was time-consuming and could be done more effectively in a group class at a clinic before surgery. “We didn’t know it was a problem until it was down on paper,” Ms. Krage said. Armed with the new information, Gundersen was able to pinpoint waste, and it set out to cut inefficiencies and lower costs. Changes to the process mean the knee surgery now costs the hospital an average $8,700 at most to perform, an 18% savings. The new process was on display one day this June. Gundersen orthopedic surgeon Mark Topolski and his team prepared for a knee replacement on patient Walter Spolum, a 75-year-old retired railroad blacksmith from Tomah, Wis.
Mr. Spolum’s arms and healthy knee had been gently fastened to the operating table with protective padding, with help from perioperative technician Billy Ortiz. 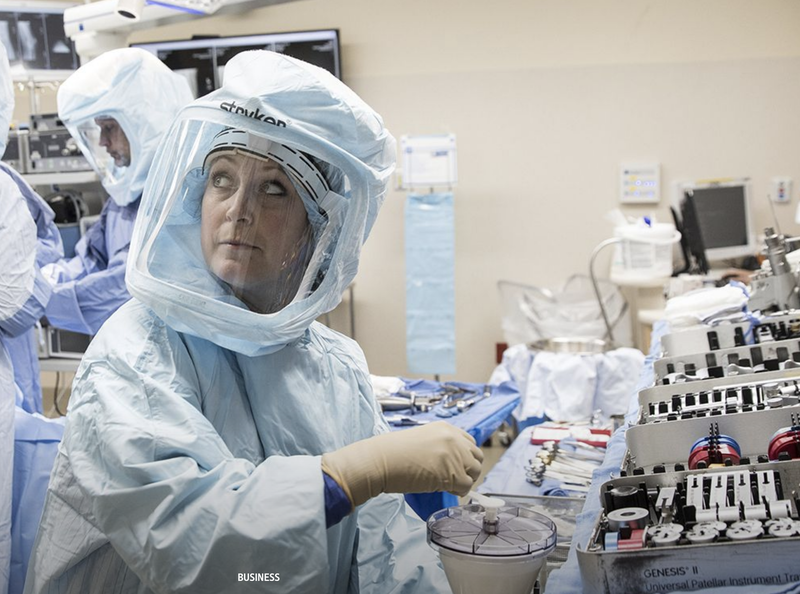 Before the cost investigation, the surgical team was responsible for positioning the patient for surgery, but Gundersen’s analysis showed that distracted and slowed them as they readied the operating room. Bringing in Mr. Ortiz helped reduce time in the OR by 5 to 10 minutes, lowering the cost. Dr. Topolski swiftly moves through each step of the procedure, which he performs routinely with the same staff. 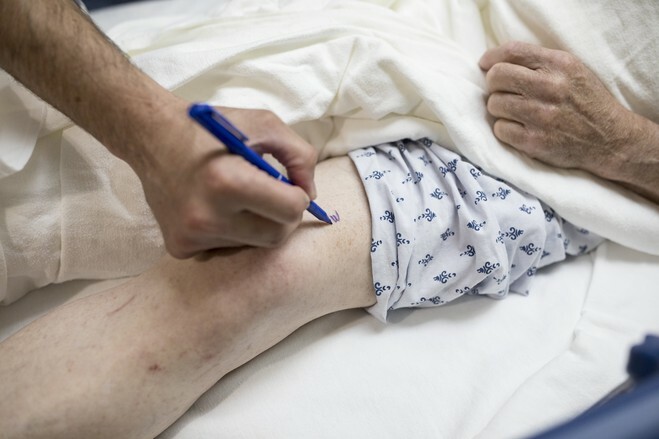 After a neat incision, he works with a surgical assistant and nurse practitioner to clear damaged tissue from the patient’s knee, shaving away bone where they will attach the new one. 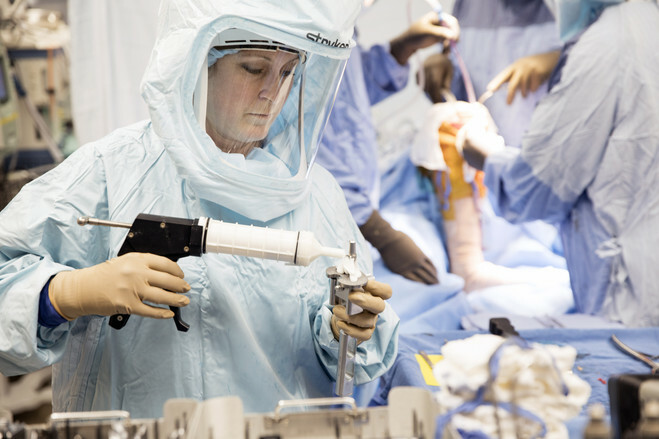 To secure the artificial joint to the bone, Dr. Topolski calls for a technician to prepare a strong adhesive known as bone cement. On a nearby table, a technician churns the mixture by hand, then assembles what resembles a caulk gun loaded with cement, which she hands to the surgeon. Gundersen’s analysis found that the hospital had been exclusively using brand-name cement, premixed with antibiotics. The hospital slashed its cement costs by 57% by switching to a generic, which research shows can be used in most cases with the same results. Staff can hand-mix antibiotics into generic cement when needed. It isn’t clear how the orthopedics department came to use the brand-name cement, said hospital staff. Dr. Topolski, in an interview before the surgery, said he was perplexed when the analysis uncovered it. After the surgery, surgical nurse Emily McGrath visited Mr. Spolum on the orthopedic unit. Gundersen created Ms. McGrath’s job to prevent the treatment delays uncovered during the review. She steps in “wherever I’m needed,” she said. She tested Mr. Spolum’s mobility, urged him to eat and coached him on using a device to measure lung strength. That same day, a physical therapist appeared to help him take his first post-surgery walk. Mr. Spolum, who had tossed hay bales at his hobby farm with his grandchildren the week before surgery, returned home the next day. His stay at the hospital was a full day shorter than his last visit to Gundersen in August 2016, when the same surgeon replaced his other knee, said Sherrie Spolum, his wife. “That was just fine with him, he wanted to get home,” she said. Since the knee-surgery investigation, Gundersen has scrutinized the cost of its laboratory services, which other hospitals use under contract. Gundersen squeezed those costs and lowered prices, holding on to business against encroaching national laboratory chains, said Ms. Wied, who is now a vice president of operations for Gundersen Health System. The more Gundersen wrings from its costs, the more potential profit it earns. Because Gundersen and the majority of U.S. hospitals are charitable corporations, profits don’t go to shareholders. Income instead gets poured into new equipment, construction or acquisitions, and is used to subsidize medical care that loses money. An employer group in Madison, Wis., presented Gundersen with another option: Cut the prices it charges patients. After the surgery, nurse Emily McGrath tested Mr. Spolum’s mobility. The hospital created her job after the study to step in where needed to prevent treatment delays. As Gundersen was concluding its cost evaluations, the group known as the Alliance approached it with an ultimatum. Hospitals elsewhere in Wisconsin with good quality results had cut knee-replacement prices by more than 20% on average to win their business, the employer group said. Gundersen could do the same, or risk losing patients. The Alliance entered La Crosse only the year before, but its foothold was growing. The employer group represents 5,600 people in La Crosse and 88,000 people across three states. Hospital executives believed similar demands from other payers would follow. A bid for the Alliance’s business would be a test run. Executives weighed a price cut by considering the new savings from improved efficiency, and factoring in overhead costs, including human resources, maintenance and utilities, while keeping an eye on profit margins. Ultimately, Gundersen lowered its price for the Alliance employers. The hospital declined to disclose the negotiated price, but said it still makes money on the procedures it does for Alliance members. The Alliance also declined to disclose details. Gundersen’s list price for the knee surgery, not including the surgeon and anesthesiologist, in 2017 dropped 7%, which it attributed to shorter hospital stays. At Wieser Brothers, a general contractor nearby in La Crescent, Minn, that is part of the Alliance, the agreement with Gundersen will reduce the price of knee surgery for its employees. It expects the discount to be greater than 30% off the list price. Executives at the company, which has nearly 200 people enrolled in its health-insurance plan, described the price cut as welcome but puzzling. Co-founder Jeff Wieser said the company tracks its own costs in minute detail—down to the expense for fire extinguishers, toilet accessories and temporary telephones it would need to compete for jobs such as a recent one to remodel a Minnesota high school. Wieser uses software to track labor; solicit competing bids from subcontractors; and itemize supplies. “There’s no reason they can’t run a business like we do,” said Mr. Wieser.